Dumont JETS started their partnership with Leavine Family Racing in the fall of 2017 for the 2018 season and have been gracious enough to share their perspective on their experience with our blog readers. Key members of our organization are fans of Kasey Kahne and NASCAR, which sparked our initial interest in a NASCAR sponsorship with LFR. The partnership established with LFR transcended the constraints of mere fandom and ultimately dovetailed perfectly into our overall marketing strategy. Once the idea of a sponsorship with LFR came to be, we began looking for creative ways to provide assets for the LFR team in exchange for increased exposure of the Dumont JETS brand. From a nuts and bolts perspective, Dumont JETS provided jet card flight time to the team in exchange for a marketing package as an “Official Sponsor of Leavine Family Racing”. This included a full year logo placement on the car as well as a primary Dumont JETS paint scheme for one race. What came out of our partnership with LFR was much more than brand awareness from logos. It is important to note that while the typical NASCAR fan is not our customer base for jet cards and retail charter services, there are many other connections throughout the sport that are beneficial to our company. Without our work with LFR to understand the benefits of a sponsorship beyond the fan audience, we may have passed on our sponsorship and ultimately missed out on building these key connections. Because our benefits from the sponsorship are less traditional than the consumer-facing angle, connecting the Dumont JETS corporate aviation world with NASCAR initially felt like a bit of a leap of faith for us, but, ultimately, the opportunities that have arose as a result are beyond what we expected. From the relationships we are building with Fortune 500 companies and additional race teams, to the name recognition on the car, and everything in between, we recognize the many benefits of NASCAR sponsorship across all aspects of the sport. Another benefit that we have been honored to receive is meeting and forming relationships with other drivers and team owners. Because many drivers and teams own aircraft or may be looking to purchase an aircraft in the near future and Dumont offers support for all aspects of plane ownership, it’s easy to see why these connections are valuable. From our aircraft sales and management divisions, to maintenance and part sales, we can cover the lifetime ownership of an aircraft for the driver or team’s ownership cycle. Our connections to these audiences allow us to share that we can offer these services to them when they are in need. In the relatively short time we have been affiliated with the team, we have already experienced success from our relationship with Leavine Family Racing. As a result of our partnership, we have sold jet cards, aircraft disassembly projects, and retail charter business. Going into the 2018 NASCAR season we were looking forward to developing our relationship with Kasey Kahne, the Leavine Family Racing team, and the NASCAR community with an entry-level sponsorship plan. We wanted to test the waters, so to speak, and see what the appetite was for Dumont JETS to enter the world of NASCAR. We estimate that our return on investment for the initial partnership is about break even and we are very excited about that successful first year. Based on the success of our partnership in 2018, we have increased our marketing spend for 2019. As we look to the 2019 season, we are pleased to announce that the Leavine Family Racing team and Dumont JETS will proudly work with Matt DiBenedetto and partner with Toyota Racing. Based on the success of our partnership in 2018, we have increased our marketing spend for 2019. As our investment has grown, so have our expectations, and we look forward to the increased return from the expanded partnership. The shift to Toyota brings great opportunities to Leavine Family Racing and Dumont JETS. 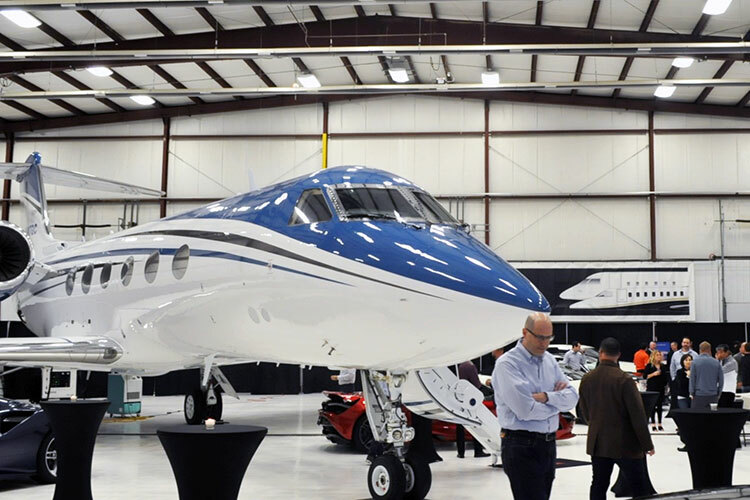 The increased exposure we will receive, coupled with the association with Toyota Racing means increased business and, hopefully, increased return for Dumont JETS. We will gain access to the 1,500 plus Toyota and Lexus dealerships, many of which already own an aircraft or fly privately for business and family trips. We are looking forward to Matt DiBenedetto piloting the Dumont JETS Camry into the upcoming season. In 2019, Dumont JETS will be the primary sponsor for 3 races: Las Vegas, NV., Dover, DE. and Phoenix, AZ. Each track will provide their own benefits for the Dumont JETS team and their guests. With many charter customers and owners flying in and out of Las Vegas, this will be a unique opportunity to introduce them to NASCAR and the business relationships behind the sport. They will have the opportunity to experience the excitement first hand … from the driver meet-and-greet to the pre-race grid walk; the excitement around the track is undeniable. Convenient for us, Dover International Speedway is less than an hour from our headquarters and allows for us to host local customers as well as our employees for an exciting day of racing. In addition to the race day festivities Dumont JETS will host our third annual Open Hangar. This event has been extremely successful for us in the past and we know next year will be just as exciting. 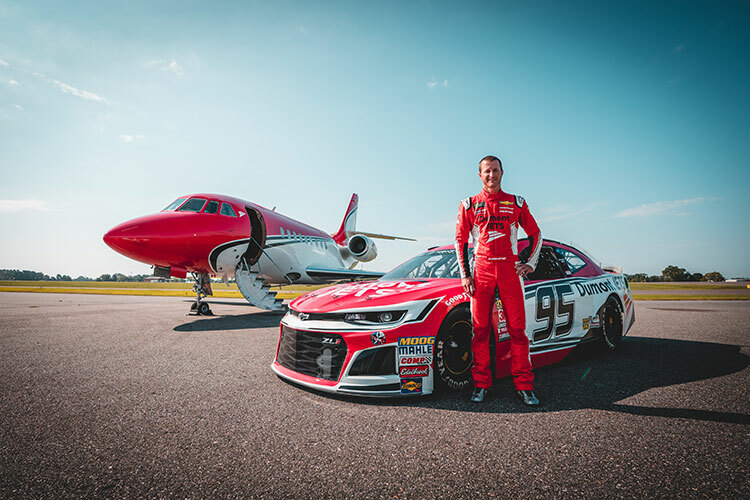 With the Dumont JETS show car as well as other exotic sports cars and aircraft on display, our guests can mingle and enjoy the company of NASCAR driver Matt DiBenedetto. The third and final race for Dumont JETS will be the Phoenix fall race. This is a great market for us, where we can bring together, and augment, our partnerships within the golf and NASCAR communities and provide an exceptional entertainment opportunity for our clients. Customers and owners can meet - and play a round of golf with - NASCAR driver Matt DiBenedetto and our golf partner PGA Pro-Golfer Ryan Moore, as well as attend the race and enjoy the upfront view from the pit box. All in all, we at Dumont JETS are very pleased with our partner relationship with Leavine Family Racing. One might rightly suggest that an aircraft charter company and a NASCAR race team make a strange pair. However, the principles at LFR worked to understand our business, and how the unique B2B environment in NASCAR could deliver value for our organization. The return on our investment in year one is a testament to the available opportunity, and we look forward to building on that success in 2019. Just as it did for Dumont JETS, NASCAR sponsorships increase brand awareness, marketshare & revenues for sponsor businesses. Let's talk about how a team sponsorship help grow your business. 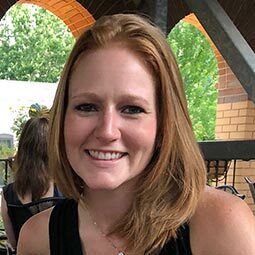 Amber Martin (Director of Corporate Relations) has been with Dumont Group since 2013 and oversees the infrastructure and logistics on the internal side of the Dumont Group Companies as well as corporate relations with external customers and vendors. Prior to joining Dumont Group she worked in the banking and finance industries and holds an MBA from Goldey-Beacom College.